Professor Yoshida graduated from the zoology course in the University of Tokyo’s Department of Biology in 1990. In 1995 he obtained his Ph.D. in Science after completion of the zoology program in the Graduate School of Sciences. He then became a RIKEN Special Postdoctoral fellow, and in 1998 took a position as an assistant professor at the University of Tokyo Misaki Marine Biological Station. After serving in 2001 as a visiting researcher at Statione Zoologica Anton Dohrn in Naples, Italy, he became a researcher at the Japan Science and Technology Agency’s Calcium Oscillation Project. He then became an instructor at the University of Tokyo Misaki Marine Biological Station, and took up his current position in 2009. Living organisms occupy the niche between generality and diversity. There are an estimated ten million forms of life on our planet, each one adapted to its particular environment through survival strategies reflected in the organisms’ diverse forms. Yet there are many similarities among the mechanisms and structures utilized by this wide variety of organisms. All living things are composed of cells, and those cells are largely the same, being composed of water, proteins, and nucleic acids. Also similar among all living things is that they obtain energy to perform life activities through techniques such as photosynthesis or respiration, and each has a method for self-replication of genetic information to pass on to the next generation. All organisms that engage in sexual reproduction create new life through a fertilization process that relies on the joining of a male sperm and a female egg. However in the midst of this universal process there are species-specific characteristics, says Associate Professor Manabu Yoshida, whose research focuses on fertilization. From the moment that a single new life is created, all organisms display a combination of generality and diversity. There is a complex mechanism and delicate timing behind the meeting of sperm and egg for fertilization. There are many hurdles that must be crossed for new life to be created, and many of these remain only poorly understood. 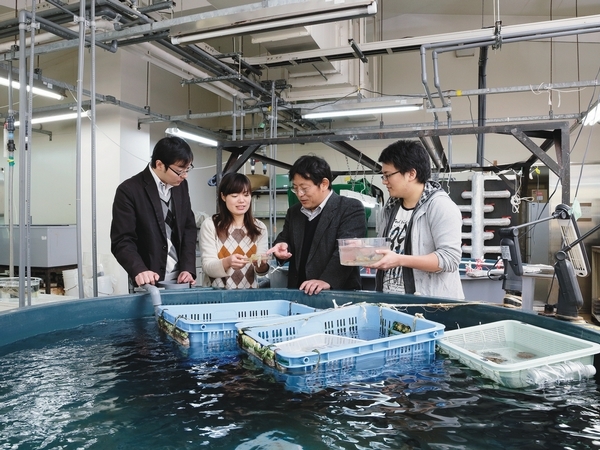 Although his research also includes fertilization in mice, Professor Yoshida’s laboratory is part of the Marine Biological Station in the Graduate School of Science. Established in 1886, it is one of the oldest marine laboratories in the world, and is located at Misaki, at the southwest tip of the Miura Peninsula, which is home to a bountiful array of biota. There, Professor Yoshida studies the fertilization of marine invertebrates such as tunicates. Students perform research following individual themes, but every other week they meet for team discussions. “But they’re more like family gatherings,” says Chihiro Ono (D2). “Even the professor’s wife joins in.” Professor Yoshida also sometimes hosts parties at his home, at which he shows off his skill as a chef. Our oceans truly connect the world, both physically and through the researchers who study it. Eggs from the tunicate Ciona intestinalis release the chemoattractant steroid SAAF to guide sperm cells. 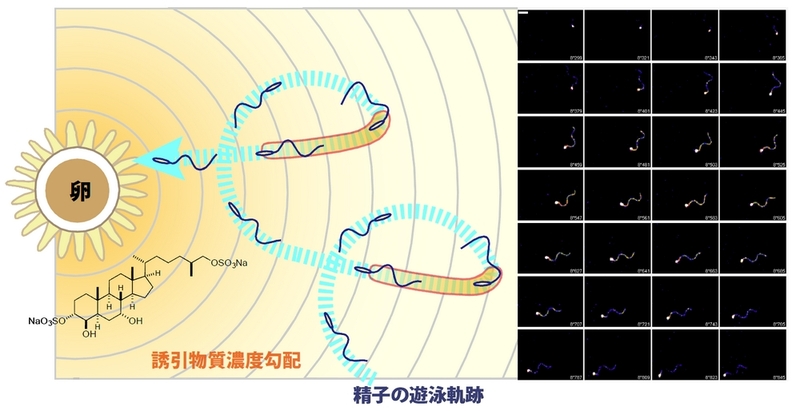 When a sperm heads in a direction away from the egg (a direction in which the concentration of SAAF becomes lower), levels of Ca2+ transiently rise in its flagellum, causing it to change direction until it is once again oriented toward the egg.